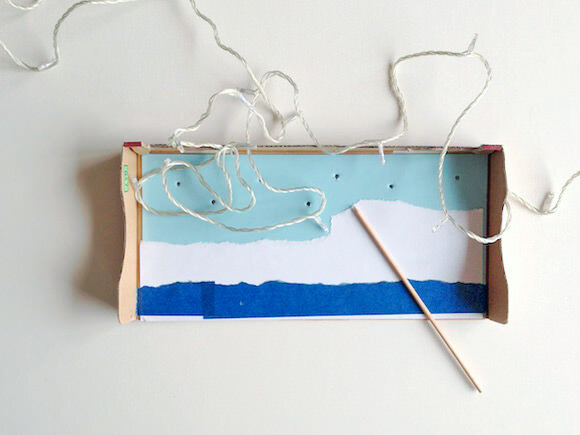 Got an extra shoebox lying around? 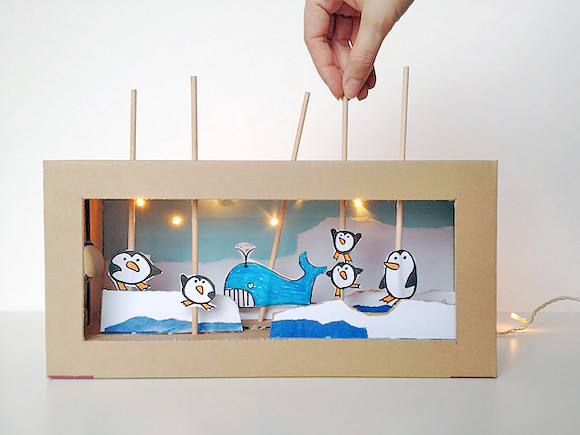 Recycle it into an arctic-themed puppet theater with working lights! 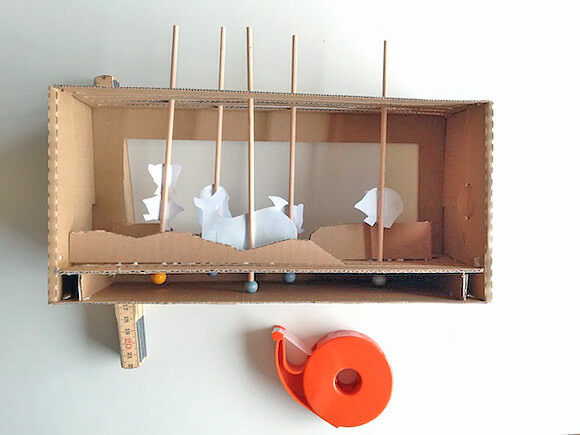 It’s a blast to make and perfect for impromptu imaginative play, even after the lights go out. 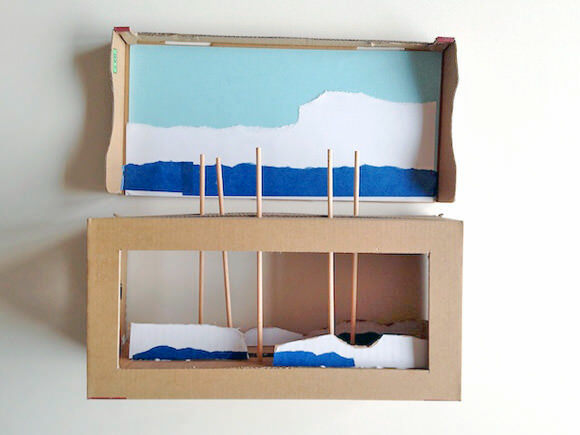 Note: Because of small parts, this is a project best suited for children 3 years and older. 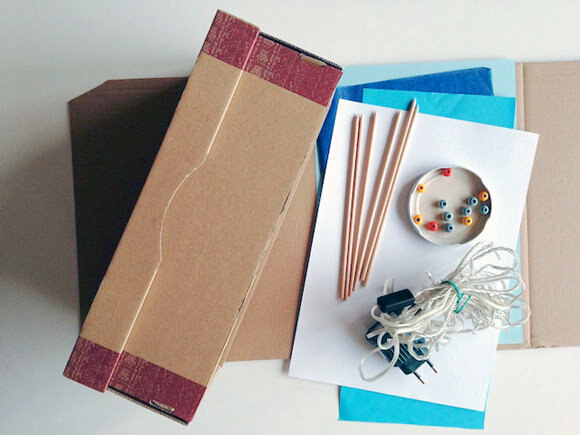 Older children and adults can prepare the box. 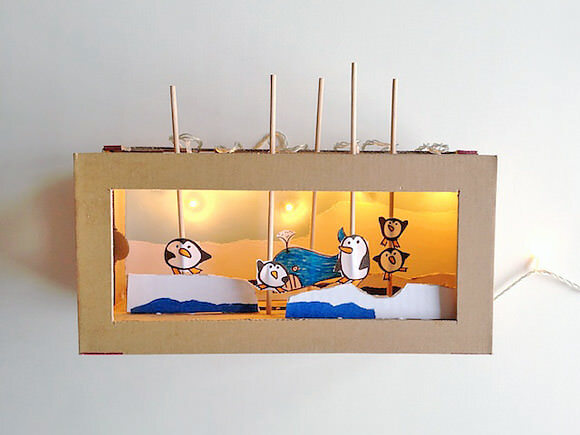 Young kids can draw, decorate, and play with the theater. Mark a frame on the bottom of the shoebox and cut it out as shown. 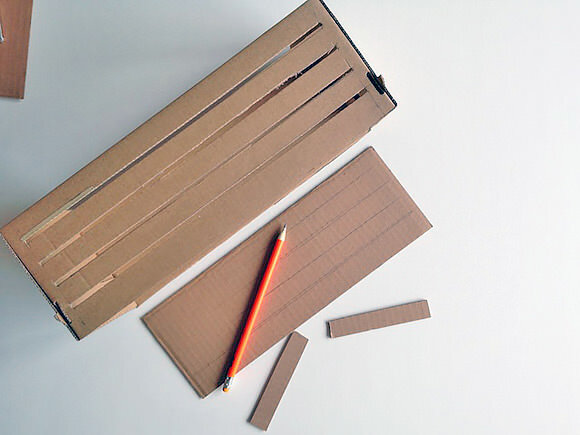 Draw 3 or 4 lines on a long side of the shoebox. 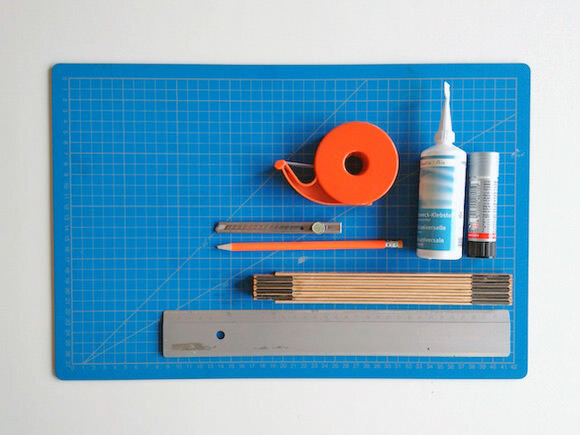 Cut the slots with your craft knife (make sure that they are wider than the wooden skewers). 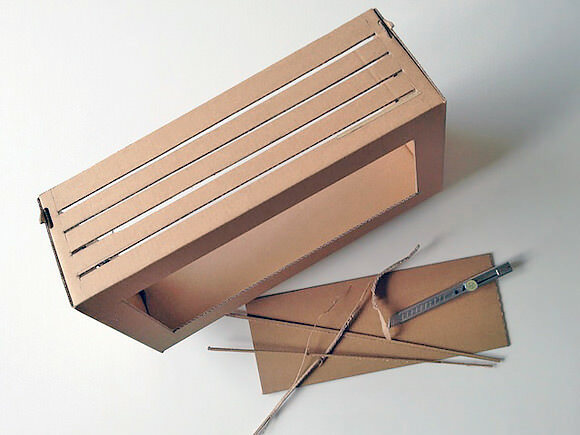 To make a platform, mark and cut the same lines as before on a slightly smaller piece of cardboard that should fit inside the box as shown. Cut two smaller pieces to fit between the two floors, so that the platform aligns with the bottom of the frame. Important note: Try out the sticks at this point: They should move easily; if they don’t, cut the slots wider to accommodate them. Glue in the two separator pieces and the platform. 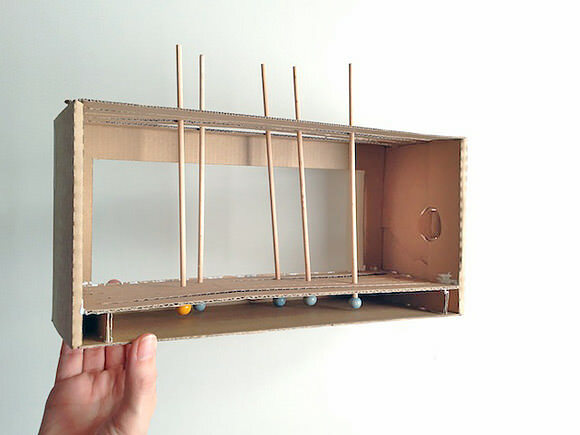 Add glue to the holes of the beads and fit them on the sticks through the slots. Let’s decorate! 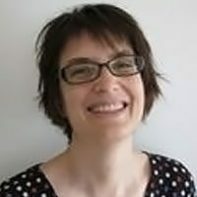 Use the lid of the shoebox for the background. 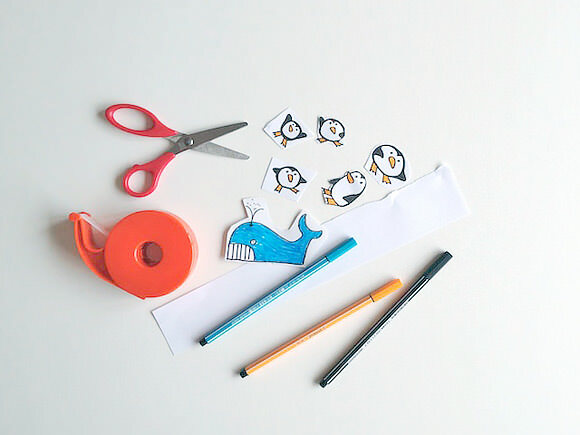 To create the arctic theme, I used blue and white paper to create and arctic theme. Tear the white paper for the snowy parts. 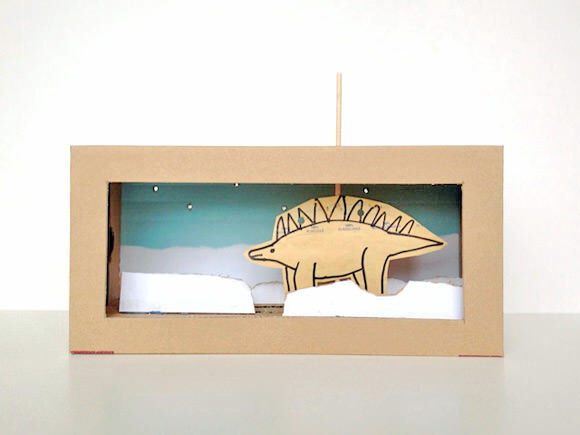 Cut three smaller cardboard pieces, then decorate and glue them between the lines on the floor for layered ice. It’s time to create your frosty thespians! 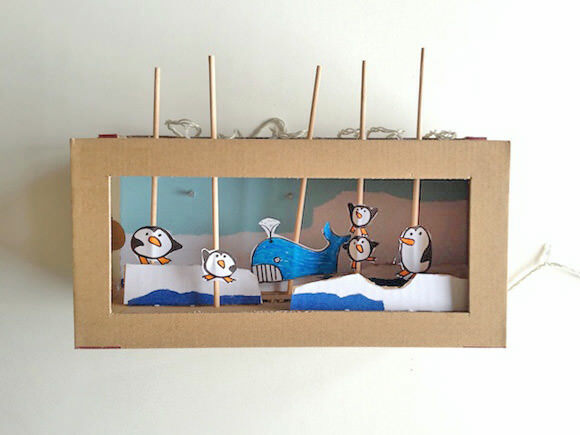 Draw several penguins and a whale (children’s drawings make nice puppets). Color and cut out the puppets. Tape them to the wooden skewers. 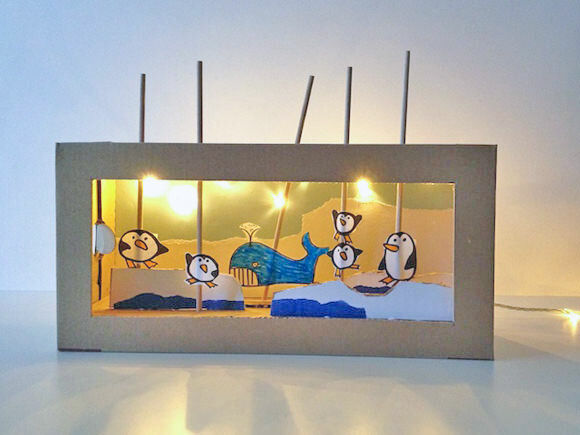 Make several holes in the background using a wooden skewer and fit in the LED. Tape the electric cord to the back of the lid. It’s time to turn down the lights and start the play! 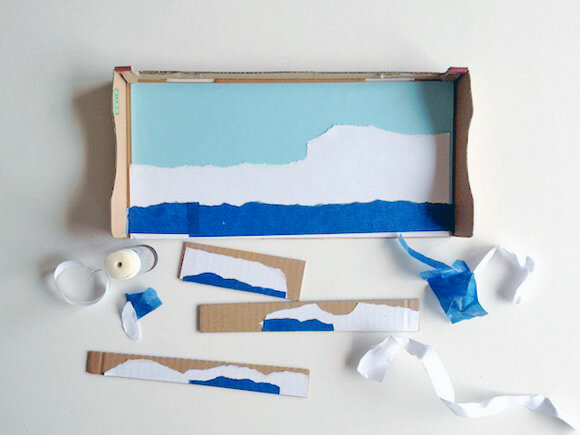 For another option, take away the blue paper to create a snowy forest. Add a fox, a squirrel, and other forest creatures as your main characters. Now look who’s stomping through the snow! Others are too afraid to join the dinosaur, so you’ll need to prepare a second shoebox for sure. Hahahaaa! That is just super fun! Great project for the whole family to enjoy! I love the dino at the end! for sure! We haven’t been snowed in as much as just too cold to go out. We love it! Thankfully, all three kiddos just got new shoes so no fighting over the boxes! Awesome. I can already imagine the shows the little one and I can put on. Thanks for the great idea. Does anyone know where you can buy the strand LED Christmas light (10 lights)? This is sooo cute, i really want to try this now!